Samsung Galaxy A7 2016 has already received a replacement in the shape of Galaxy A7 2017, but this doesn’t mean the Korean company has neglected the older model. The phone was released in December 2015 and started selling across the globe as from January 2016 onwards, but back then, it came preinstalled with Android 5.1.1 Lollipop. Since its release, Samsung Galaxy A7 2016 has already been updated to the year-old Android Marshmallow, but the phone is now getting ready for an update to Android 7.0 Nougat, at least according to the latest benchmarks. 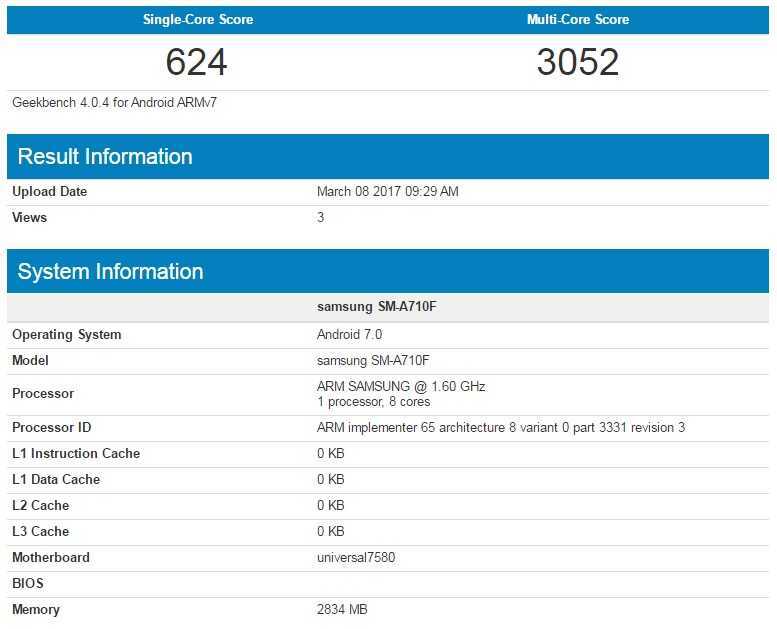 Listed via Geekbench, it seems Samsung has started testing the new Android 7.0 Nougat OS on the year-old Galaxy A7 2016 handset, an indicator that the release date is not so far away. The phone listed has model number SM-A710F and it already runs the Nougat OS. From the tests, the Galaxy A7 2016 managed a single-core score of 624 while the multi-core score stood at 3052. In case you didn’t know, these scores are as a result of a combination between the new software and a decent hardware configuration that includes an octa-core Exynos 7580 that is clocked at a speed of 1.6GHz and paired with a RAM of 3GB. However, there is also another variant that is powered by a Snapdragon 615 SoC, although the rest of the specs remain unchanged. Other specs of Samsung Galaxy A7 2016 include a 5.5-inch 1080p Super AMOLED screen that is protected by Gorilla Glass 4 technology. The back has a 13MP shooter that packs some impressive specs, including an aperture of f/1.9, OIS, AF and LED flash. As for the front, you get a 5MP shooter that keeps the same aperture. To keep the phone alive is a 3300mAh battery that is supported by fast charging technology. You also get a front-facing fingerprint scanner on the phone. Note that the appearance of Samsung Galaxy A7 2016 on Geekbench with Android 7.0 Nougat running the show doesn’t confirm that the OS is ready for download, rather, it means that it’s being tested and should be released in the coming weeks. Stay tuned and we’ll let you know when this happens!